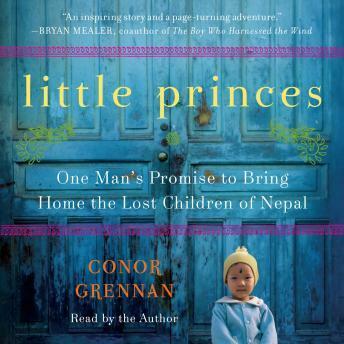 Little Princes: One Man’s Promise to Bring Home the Lost Children of Nepal by Conor Grennan. In search of adventure, 29-year-old Conor Grennan traded his day job for a year-long trip around the globe, a journey that began with a three-month stint volunteering at the Little Princes Children’s Home, an orphanage in war-torn Nepal.Conor was initially reluctant to volunteer, unsure whether he had the proper skill, or enough passion, to get involved in a developing country in the middle of a civil war. But he was soon overcome by the herd of rambunctious, resilient children who would challenge and reward him in a way that he had never imagined. When Conor learned the unthinkable truth about their situation, he was stunned: The children were not orphans at all. Child traffickers were promising families in remote villages to protect their children from the civil war—for a huge fee—by taking them to safety. They would then abandon the children far from home, in the chaos of Nepal’s capital, Kathmandu. For Conor, what began as a footloose adventure becomes a commitment to reunite the children he had grown to love with their families, but this would be no small task. He would risk his life on a journey through the legendary mountains of Nepal, facing the dangers of a bloody civil war and a debilitating injury. Waiting for Conor back in Kathmandu, and hopeful he would make it out before being trapped in by snow, was the woman who would eventually become his wife and share his life’s work. Little Princes is a true story of families and children, and what one person is capable of when faced with seemingly insurmountable odds. At turns tragic, joyful, and hilarious, Little Princes is a testament to the power of faith and the ability of love to carry us beyond our wildest expectations.